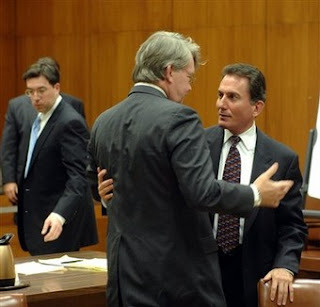 From USA Today – Michael Dowd, center and Ben Rubinowitz, attorneys for the plaintiffs in $150 million lawsuit against Diocese of Rockville Centre, embrace after the jury returned a verdict in their favor, Friday, May 18, 2007 in Mineola, N.Y.. Awarding their clients a combined a combined $11.4 million in damages, the jury found the nation’s sixth-largest Roman Catholic diocese and a church parish negligent in a case involving a youth minister who repeatedly raped and sodomized teenagers in his care over several years. Kevin McNiff, the attorney representing the Diocese of Rockville Centre, is seen at left rear.